The Arizona treasurer’s race pits the state senate majority leader and former treasurer’s office employee against a tax attorney and former Maricopa County Democratic Party chairman who aspires to shake things up in the state office. The Arizona Corporation Commission member has been seeking the seat for more than a year but announced his withdrawal Thursday. He was facing state Sen. Kimberly Yee in August's Republican primary. The 43-year-old Phoenix Republican has announced her candidacy for the office now held by fellow Republican Jeff DeWit, who is not running for re-election. State Treasurer Jeff DeWit’s decision not to seek a second term in 2018 may not be as ironclad as it seemed earlier this year. Arizona's treasurer says he won't run for re-election when his term ends in 2018. 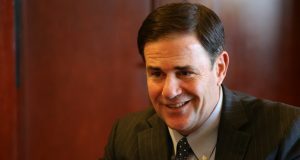 Doug Ducey’s extensive fundraising may not be enough to keep up with prolific advertising, according to a recent campaign finance report.